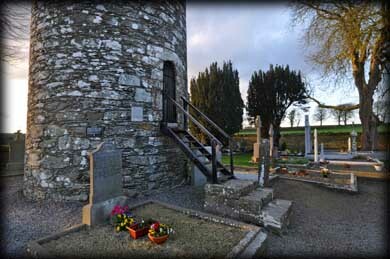 Without doubt Monasterboice is mostly famous for the three high crosses located here. But there are a number of other fabulous antiquities present here at one of my favourite monastic sites. Amongst them is this 28.5 metre high round tower. The doorway to the tower is only 1.84 metres above ground level suggesting that the ground level may have risen by a few metres, normally the doorways are much higher up from the ground. Together with the now missing conical cap the tower may have been up to 33 metres tall. Although there is a modern wooden stair up to the east facing doorway there is no public access at present. Unlike the rest of the tower the facing stones of the doorway and the window above it are constructed from sandstone and the doorway has double banded moulding.. 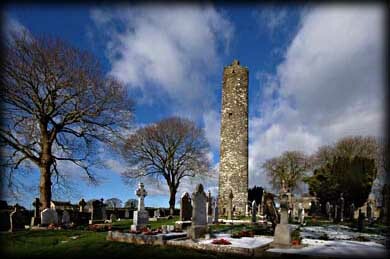 The tower was used as a belfry and a beacon for pilgrims, as well as to shelter the monks and their treasures from viking raiders. The inside of the tower and it's treasures including a library were badly burned during a raid in 1097. I have found the spring and autumn to be the best time to visit, not too many tourists and gorgeous light around this time. In addition to the crosses and round tower there is a sundial next to the north cross. The shaft is decorated with a cross of arcs indicating a place of pilgrimage. Situated: 8 kilometres north west of Drogheda. From Drogheda take the R132 north, after 7K take a sign-posted left turn for Monasterboice, from here you can see the round tower situated on your left. Discovery Map 36: O 0427 8207. Last visit Mar 2012. Dimensions: Height 28.5 m. Diameter: 4.98 m.
Door: Above ground 1.84m. Type: Lintelled with an arch cut into the lintel. Windows: Four, one angled headed and three lintelled.